This Sonic site is ready to glow 'n' go...if something's not working, feel free to yell in my general direction. What's New: Just an ugly ol' text file that lists any major updates to this site. How to Draw Sonic: I don't have any model sheets, but this is close enough. 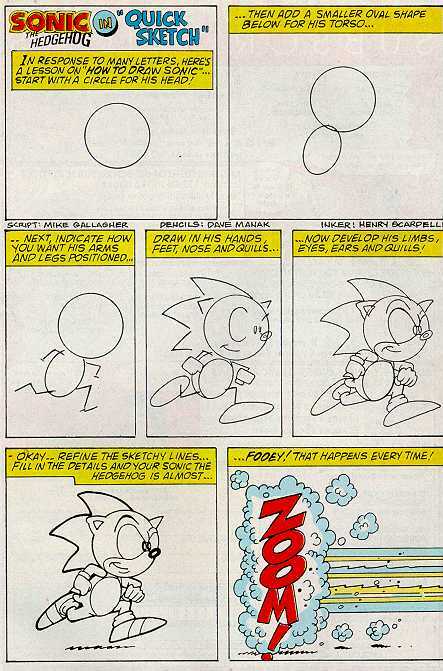 Originally printed in Sonic the Hedgehog #9 (published by Archie Comics). Mobian Fan Art:A page for my Sonic/Freedom Fighters of Mobius related fan-art. MoKat's Cheats: A collection of cheat codes for most of the Sonic games for the PC and Genesis/Megadrive. Includes an section devoted to Game Genie codes. MoKat's Sonic Images Collection: I didn't make these! I just scanned them or collected them from various sources. Save Knuckles! :The post(s) in which the fandom was given an early warning that Archie Comics' Knuckles the Echidna would get -cancelled-! MoKat's Way Kool Links: Some of my favorite links, Sonic-related and otherwise. As of May 18, 2018 Lycos discontinued their free e-mail service, so if you really need to talk to me, try the forums at FUS. Space Ace stuff, cuz I was a fan of -that- game before Sonic even existed.